Mother Of Herbs plant, Coleus amboinicus, is also known as All Purpose Herb, Cuban Oregano and Fruit Salad Herb. A succulent herb with very attractive white/green leaves and lavender flowers. The aromatic leaves are a flavouring for meat, vegetables or chopped and toasted on bread and butter. A bedtime tea to induce sleep. The antiseptic leaves are also chewed to relieve a sore throat. 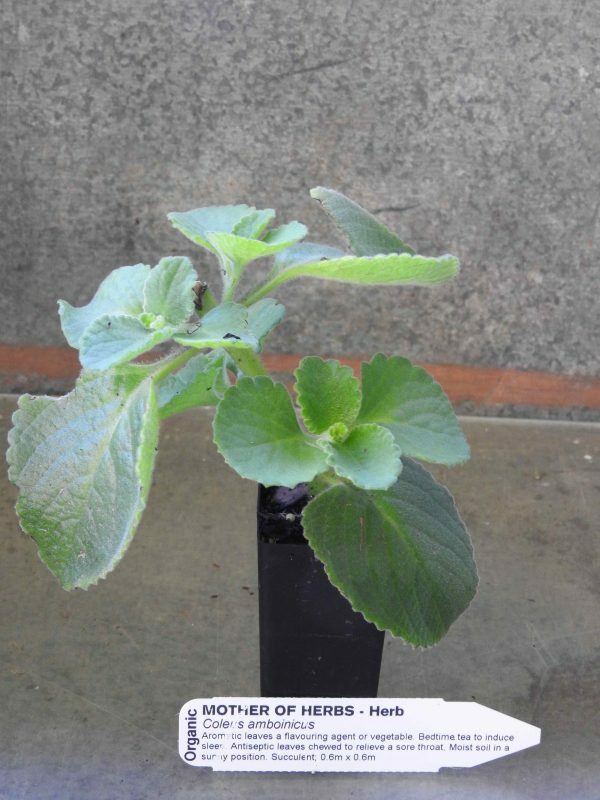 Mother Of Herbs plant is native to Indonesia, Fiji or Cuba and prefers a moist, well drained soil in a sunny position. Drought resistant but frost tender. This succulent herb may grow to 0.6m x 0.6m. Be the first to review “Mother Of Herbs, plant” Click here to cancel reply.